The PVD 1800 is a broadcast quality compact SDI frame synchronizer with highquality Up/Down/Cross converter and scaler for professional applications in theBroadcast, Post Production and Pro A/V industry. 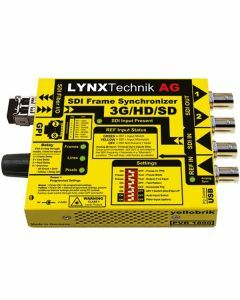 The frame synchronizer utilizes robust “flywheel” algorithms that will accommodate a wide variety of low quality asynchronous SDI sources. All embedded audio is extracted and delayed automatically to match the video processing delay. The module also provides up to 30 frames of programmable output delay, adjustable in frames, lines and pixels. The module is fully compatible with the yelloGUI software package, so the module can be configured, controlled and updated using a PC or MAC. Timing Adjustment: Up to 30 frames.